Christmas is one of the few times of the year, when we can consume and digest as much food and drink as we like without feeling guilty, and worrying about our waistlines. Christmas is a time of joy, laughter, relationships, love, and enjoying good food & drink! Of course, for many of us, Christmas is about much more, but lets talk about the food for now! Roast turkey is the meat that is going to carved up for thousands on Christmas day for their dinner, and even the next days lunch! Make sure you stock up on the cranberry sauce if you're having Turkey! If you're having lamb, don't forget the mint sauce, horseradish for the beef and apple for the pork! Available at Waitrose, and English Provender Co. I don't know about you, but cheese and crackers are a must during the festie season. This delicious set contains pickle, caramelised onion chutney and cheese board chutney! If you're like me and not a fan of mince pies, Christmas pudding and all the other popular Christmas deserts, then don't fear, because Ben & Jerry's have two festive flavours for us to enjoy, Minter Wonderland and Cinnamon Buns! They don't have to be cooked, they don't have to be defrosted, and if you'd like too, you could even eat from the tub! Results all round! Available from all good supermarkets. Cottage Delight Savoury Christmas Tree // £4. Another product from Cottage Delights, can you tell I'm a fan? These savoury baked Christmas trees, made with buttery puff pastry and topped with Gouda cheese and Mediterranean herbs are perfect by themselves, or served with a dip! Christmas wouldn't be Christmas without a toast or two! These fabulous mini proseccos hold 200ml, so enough for a toast when Christmas dinner is served! They're available in a case of 24, or available to buy separately from corner shops and convenience stores! Available at Premier Estates Wine. Just because they're not old enough to taste a home cooked Christmas meal, don't let the younger generations of the family miss out! This Ella's Kitchen Christmas Dinner pouch is 130g of yumminess, with organic turkey, potatoes and veg (parsnips, onions, carrots, red cabbage, green beans, brussel sprouts) along with organic cranberries, and mixed herbs (sage, parsley, thyme and marjoram). Ella's Kitchen have teamed up with Save the Children, with 30p of each sale of the Christmas dinner going to Save the Children's FAST programme! Available at all good supermarkets. The last, but not least product, is my third favourite from Cottage Delight and that's their traditional mint sauce! We're hoping to have lamb to go with our Christmas turkey, and this is the best mint sauce I've ever tasted! It also goes well in hot pots and casseroles too, you know for any left over Christmas meat! The Jelly Bean Factory have three different 100g festive tubs available to enjoy over the festive period! Whether they're going to be enjoyed by the whole family, or going into an individual's stocking, you can't beat the delicious beans full of flavour! Other varieties include Santa's Sleigh Beans and Red Nosed Rudolphs! Available from all leading retailers. With the warming flavour of cinnamon, mixed with delicious hazelnuts, these stars are the perfect biscuits for the whole family to enjoy! With more and more Brits on the hunt for traditional German delicacies at Christmas time, the Bahlsen range is a great place to fulfil your sweet cravings and show your children to a wider range of world wide products. Available from Waitrose & Ocado. When it's Christmas, you've got to settle down with the family at least once over the festive period to enjoy a festive film! The fabulous people over at Butterkist have brought out this limited edition gingerbread version just in time for Christmas, we've not tasted it yet, but we bet it taste good! Available at Morrisons, Sainsbury's and Tesco. The Cadbury's Hero Tub gives everyone the option to eat their favourite chocolates with this fabulous selection! Enjoy much loved chocolate treats like Wispa, Twirl, Eclairs, Creme Egg, Fudge, Dairy Milk and Cadbury's Dairy Milk Caramel. Hand-popped corn, mixed with a smooth blend of peanut and almond is just one variety of six available from Propercorn! Other varieties in the range are Lightly Sea Salted, Sweet Coconut & Vanilla, Sweet & Salty, Sour Cream & Black Pepper and Fiery Worcester Sauce & Sun-Dried Tomatoes. 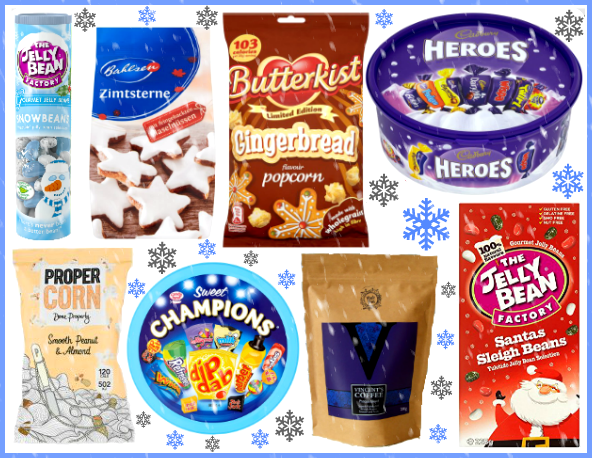 The whole variety is available to buy for just £5 as a gift box, and includes an extra pack of Sweet & Salty! Available to buy from Ocado, Tesco and Propercorn. Go back to your childhood and show the younger generation what was treats to us a few years ago! With sweets like Black Jack, Fruit Salad, Dip Dab, Refreshers, Dolly Mix, Wham, Frosties, Sherbet Fountain and Milk Bottles, along with four different lollipops - Refreshers, Fruit Salad, Black Jack and Dip Dab! Beth Vincent started Vincents Coffee because she was passionate about ethically sourced, beautifully presented and extremely high quality coffee! Freshly roasted and blended in Yorkshire, all Vincents Coffee blends are available online, with shipping available nationwide! Using flavour to categorise their blends, rather than strength, making customers know exactly what to expect! Currently, there is four blends to choose from, with a free coffee advice service recently launched, customers can send their requirements for a recommendation of the perfect blend! Along with the tubes mentioned above, The Jelly Bean Factory also have 225g gift boxes available, again including three different varieties: Santa's Sleigh Beans, Snowbeans and Red Nosed Rudolphs. Kopparberg is bringing something extra cosy to cider lovers this festive season with the Kopparberg Spiced Apple Gift Pack! Available from Boots stores across the UK, it's the ideal present for cider fans this Christmas! The stylish set includes a bottle of Kopparberg Spiced Apple, a selection of spiced cinnamon sticks, and a limited edition Kopparberg mug. Served warm, the Swedish drink offers a refreshing yet wintery twist on flavoured cider, or it can be served the tradition way, poured over large chunks of ice for that refreshing and gentle spicy taste. Available in individual 500ml bottles for £2.29 (SRP) from Tesco, Asda and Morrisons. Gift pack available from Boots. This limited edition pouch is bursting with individually wrapped, beautiful melt in the mouth, squares of smooth milk chocolate! Decorated with gold stars and Christmas elves, the pouch is great as a gift for chocolate lovers young and old! Other Christmas products, include Christmas boxes filled with different Godiva chocolates, and Godiva Christmas hampers. Available from John Lewis, all Godiva stores, and Godiva. A beautiful sparkling gold glitter Bailey's Christmas Tree, standing 32cm high, and containing 250g of delicious smooth milk chocolate truffles with a creamy Baileys Original Irish Cream liqueur flavoured filling! Other products in the range include Bailey's Shimmering Star (£5) and Bailey's Glittering Collection Box (£9). Available from all major retailers including Debenhams. London based company Sidekick offers a range of audacious hot sauces guaranteed to tantalise the taste buds with its blend of piquant tangs unusually accompanied with a smooth creaminess. Available in single bottles for £3.90 (perfect for stocking fillers) or as a gift box containing five flavours; Hot Tom Spicy Ketchup 250ml, Mellow Pepper (Not So) Hot Sauce, Original Zingy Pepper Hot Sauce, Aged Bonnet Hot Pepper Sauce and Screaming Pepper Extra Hot Sauce - all 150ml. The hunt for the perfect small Christmas present or stocking filler is over, treat your friends and family with a limited edition Christmas Toblerone. The much loved treat has had a makeover in time for their favourite holiday - Christmas! With four different flavours, Milk, Dark, White and Fruit & Nut making it everyone's favourite stocking filler or small gift! Available from supermarket stores nationwide. Containing three 50g jars of instant coffee, in three festive flavours; Christmas Pudding, Mulled Wine and Winter Warmer, these coffee's have less than two calories per serving, making it the perfect Christmas gift for coffee lovers! You can even create your own stash box, choosing three flavours from a choice of 16! Terry's Christmas edition is out now, and it's as festive as ever! Delight yourself and your loved ones with an indulgent Terry's Chocolate Orange this season! Dressed as a Christmas bauble for a limited time, it's the same much loved chocolate treat, containing 20 wedges of Terry's Chocolate Orange, only it's had a festive makeover! Following the recent launch of personalised classic Marmite jars, there is now personalised Naughty and Nice Christmas Marmite jars available for all those Marmite lovers out there! You either hate it or love it, but will your gift recipient be receiving a naughty design with a black devil horn, or a golden halo jar for being nice? Available from Marmite on Facebook. For any baking lovers out there, the Bakedin Baking Club is the first of its kind monthly subscription service, perfect for those who love to make and bake! Baking has never been so easy, with the Baking Club's less fuss and no waste baking kits! With exclusive recipes, only a few fresh ingredients are needed to get started! Baking Club subscribers will receive exclusive baking kits containing dry ingredients, recipes and baking tips through their letterbox each month! Available for £4.99 for the first month, £9.99 per month thereafter, or with three month (£29.99) six month £54.99) or 12 (£99.99) month subscriptions available! Spice up your curry loving loved one this Christmas with one of Hari Ghotra's curry kits! 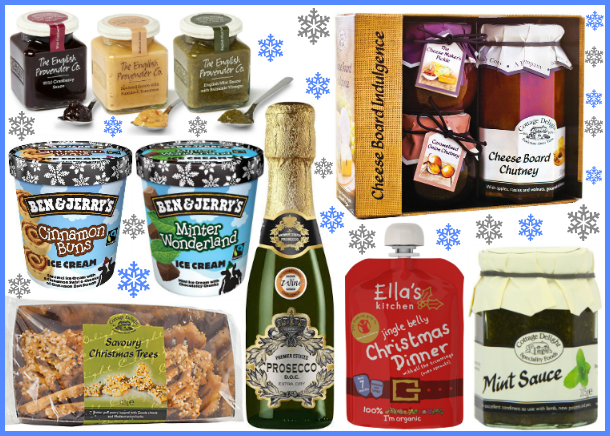 They're the perfect present for foodie lovers, or a budget gift this festive season! Making it easier to cook proper Indian food by providing proper quantities of ingredients, with handpicked spices from the expert herself! Each kit includes individually numbered bags for every stage of cooking, and easy to follow instructions! In addition, the kids include a video link so it's super easy to cook along with Hari. Choose from curry classics such as Korma, Tikka Masala and Biryani, or less common dishes from South India that incorporates coconut and Kashmiri chillies, and the creamy yet spicy Makhani. Elizabeth Shaw has not disappointed with this year's festive Christmas range, in this box, you'll find seasonal favourites for any foodie, all gloriously wrapped up in one stylish box. 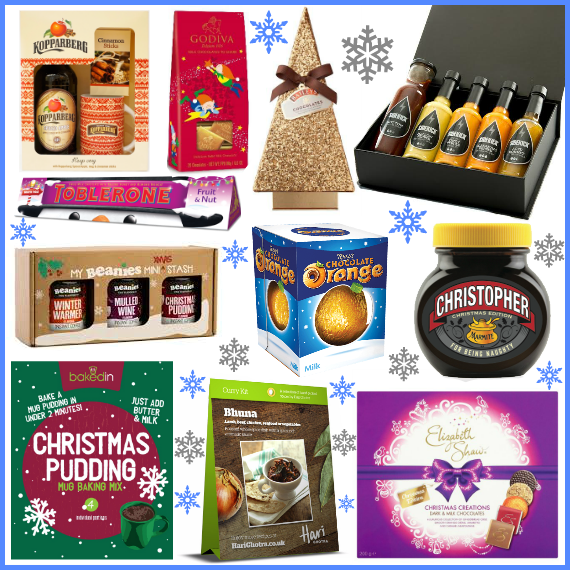 Think crunchy gingerbread crisps, rich dark orange cremes, tempting milk chocolate amaretto and delicious dark chocolate caramels! Other products from the festive range include Gingerbread Crisp, Orange Spice Crisp, The Winter Warmer Truffle Collection and Whisky Collection. Available from all leading supermarkets. A miniature version of the iconic kettle barbecue, yet large enough to feed a family, this portable model is the perfect introductory barbecue to encourage loved ones to get grilling! What's more, it comes in four wonderful Weber colours (Spring Green, Crimson Red, Slate Blue and Smoke Grey), and if it's too little for the recipient you're buying for, never fear, Weber have a whole heap of products perfect for any BBQ fan! Find your nearest stockist at Weber. The newest addition to the Tassimo range is the Tassimo Caddy, perfect for keeping your Tassimo brewer and T-Disc neatly in one place, it is the idea special gift for hot drink lovers! Featuring a handy T-Disc holder at the side of the machine, making that early morning cup of coffee or after dinner hot chocolate even easier to make, and even more tempting. Holding up to 16 disc, and the the ability to add an additional six holders, the Caddy is the perfect gift this Christmas. Other Tassimo's include the Suny (RRP £119.99) and the Vivy (around £35-£40). This new slimline combi microwave oven is the perfect gift for those foodies who moan about their ovens or the stresses of cooking! 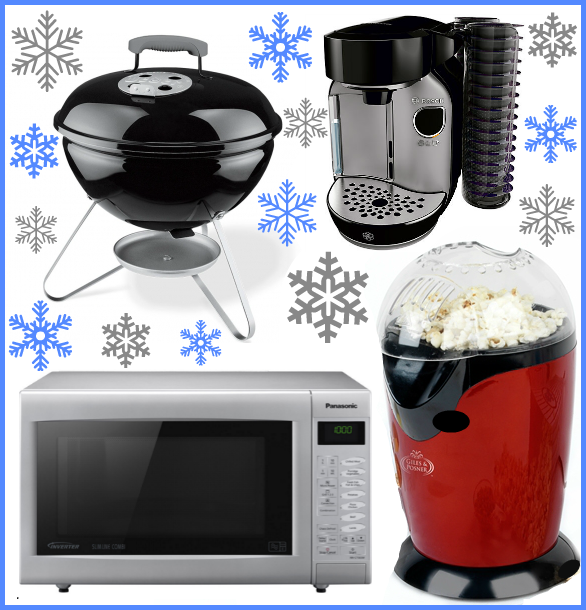 Treat your loved one, or even yourself to this combi oven, and take the Christmas stress away! Cooking almost anything an oven can, this combi microwave oven is the perfect pair of hands in any kitchen this Christmas, and what's more it'll look super stylish in any kitchen! Available from all good electrical retailers. More information at Panasonic. Everyone has that one friend or family member who is a massive popcorn fan! Why not treat them to this Giles & Posner popcorn maker, that takes less than three minutes to make the tasty snack? Using just one measuring cup of popcorn kennels is all that it takes to make a delicious homemade snack! There's a integrated measuring cup in the lid, making it easy for you to measure out the popcorn kennels, and it's durable, and easy to use with non slip feet! Available from Amazon. More information available at Giles & Posner. There we have it, the 2015 Christmas Gift Guide feature for all things foodie related! I hope you've enjoyed, please do feel free to leave a comment!